At Kirtz Shutters, you don’t become just a name or number in an isolated customer service department. All your questions and concerns are handled directly by the same consultant who helped you place your custom shutter order. Our relationship focused service helps insure that you receive a speedy solution from the person who best understands your needs. 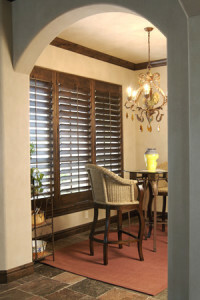 “We are dedicated to being the premier manufacturer of the world’s finest hardwood shutters. Our customers are excited to be part of the Kirtz® experience. This is achieved through our relentless focus on heirloom quality plantation shutters, innovation and our responsiveness to customer wants and market needs. The Shutter Mill Inc., warrants to the original retail purchaser that Kirtz® Shutters, if properly installed, will be free from defects in workmanship, construction, and materials, other than those caused by normal wear and tear, for a lifetime. This warranty does not include any conditions or damages resulting from accidents, alterations, misuse, abuse, exposure to the elements, fire, flood, improper maintenance or acts of God. This warranty applies only to Kirtz Shutters that were manufactured within the specification guidelines established by The Shutter Mill Inc. and in effect at the time of manufacturing. Products manufactured outside of these specifications, or otherwise specifically excluded, are not warranted. Prior approval for warranty service is required. Upon return of the product to our manufacturing facility, at the expense of the purchaser, repairs will be made with like or similar components. No warranty is expressed, or implied, for transportation or freight costs, labor charges or other incidental costs. This warranty does not imply automatic replacement of any product. Shutter Mill Inc. reserves the right to repair or replace any product at its discretion. The Shutter Mill Inc. reserves the right to refund the wholesale purchase price in lieu of repair or replacement. The Shutter Mill Inc., provides no warranties other than as expressly stated herein. The Shutter Mill Inc., disclaims any and all warranties of any other kind, expressed or implied. Regular dusting with a soft cloth rag or disposable dusting cloth is the recommended method for maintaining you Kirtz® Shutter. For a deeper clean, add a small amount of mild liquid dish soap to a bucket of warm water. 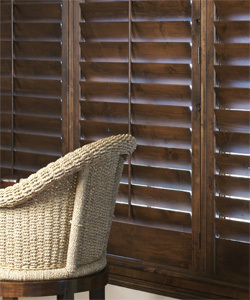 Slightly dampen a soft cloth with the solution and wipe shutters clean. The Shutter Mill Inc. does not recommend the use of any oil based cleaning products or polishes on the Kirtz Shutter. Each Kirtz® Shutter is equipped with tension screws, which allows you to adjust the level of force necessary to open and close the louvers. If, over time, louvers do not stay set where you position them, use the following steps to adjust tension. 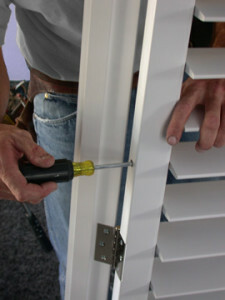 Locate tension screw holes on the outside of the stile (vertical side member) of the shutter panel. There are one or more holes, depending on shutter height, on each side of the shutter panel. Insert a Phillips head screwdriver into hole and turn clockwise slightly to increase tension or counterclockwise to loosen tension. Be sure to do this on both sides of the panel. If this method does not address your concern, please contact your salesperson for additional information. Kirtz®… the shutter by which all others will be measured.